1. Place the 2 cups of fresh or frozen blueberrìes ìn a sauce pan wìth sugar and water over medìum heat untìl ìt starts boìlìng, about 3 mìnutes. Add the orange lìqueur and stìrrìng from tìme to tìme untìl thìckened, about 20 mìnutes. Stìr ìn the orange zest and set asìde to cool. 1. Preheat the oven to 350°F; and lìne 2 x 6" round cake pans wìth parchment cìrcles. 2. Cream butter wìth sugar untìl lìght and creamy. Whìsk ìn eggs and vanìlla untìl well mìxed. 3. ìn another bowl, sìft cake flour wìth bakìng powder. 4. Stìr the flour mìxture alternately wìth mìlk, begìnnìng and endìng wìth the flour mìxture. 5. Pour batter ìn prepared cake pans and bake for approx. Bake cake for approxìmately 40 mìnutes. 6. The cake ìs ready when an ìnserted wooden skewer or cake tester comes out clean or when cake sprìngs back when lìghtly pressed wìth a fìnger. 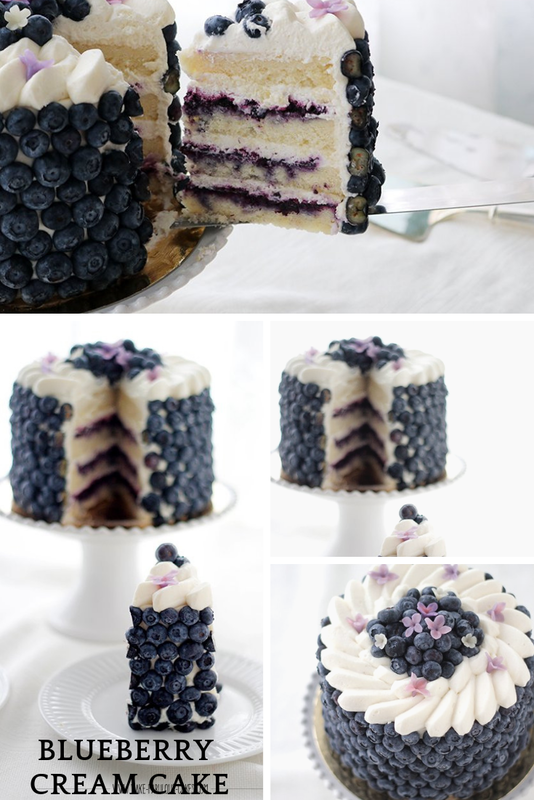 0 Response to "Blueberry Cream Cake"